with the easy-to-use of the Divio platform. Use the included free Git-based repo or add your own existing repos with extensive support for GitHub, GitLab and Bitbucket. All plans include a ready-to-go Postgres database that is configured and ready to host your data and scales with you. Worry-free scheduled and manual backups keep your data safe and secure with easy and fast restoration. The Divio Desktop tools provide a local development environment and automatically containerse your apps with easy deployment to the included test and live environments. Project templates save manual package configuration and provide pre-configured ready-to-deploy apps that you can customise and tweak to your needs. Extensive and always up-to-date documentation to help get you started with expert Node.js support available through mulitple channels. The Divio Desktop tools can automatically configure a Node.js development environment on your local desktop and make deploying your Node.js apps easy. Your apps are automatically containerised to make them highly portable and keep local, testing and live environment changes perfectly syncronised. 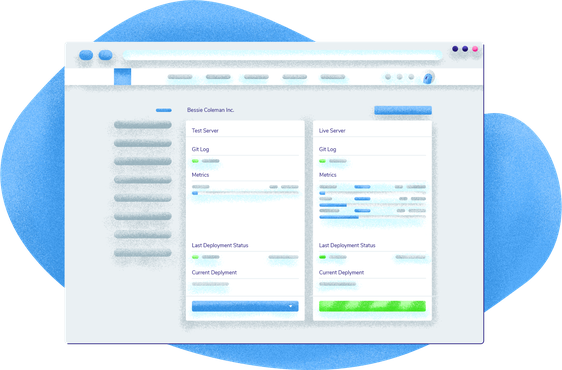 All Divio plans include testing and live environments which you can easily deploy to with a button press. You can also use the powerful Divio CLI (command line) for integration with your existing deployment process or preferred IDE. Easily scale your Node.js application with both horizontal and vertical scaling features and a choice of physical regions to give your users the fastest experience. Add or remove more instances and allocate more memory according to your application needs through the Divio Control Panel. Flat-rate predictable pricing means no unexpected bills, and with everything centralised in the Divio Control Panel, you know exactly how and where your resources are being allocated. The Divio platform uses Git to version and track changes between your local, test and live environment deployments. Git repositories are included for each project, and changes between your environments can easily be visualised and reviewed for deployment. Project types provide popular ready-to-go frameworks for your chosen technology platform that get you to a working application faster. Choose a project type and fill in the blanks to customise to your specific project needs. Boilerplates provide popular ready integrated frontend frameworks - such as Bootstrap. Explore Node.js with a free account - no strings attached! * Node.js is a trademark of Joyent, Inc. and is used with its permission. We are not endorsed by or affiliated with Joyent.